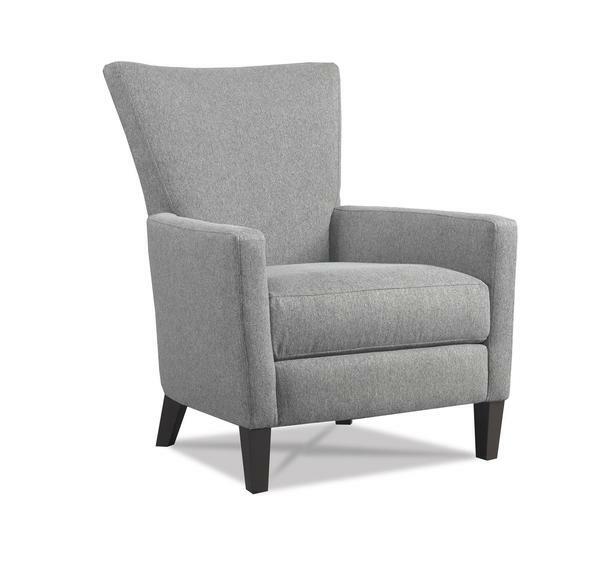 Dressed to impress with sophisticated contemporary style, the Collin Chair by Precedent offers a wide V-back creating a sharp, clean angle. This lounge chair adds a comfortable and stylish seating option anywhere you need it from living room to bedroom. For added pizzazz, you can have nailhead trim lining the base of the chair. The Collin Chair is part of the Precedent Modern Living Room Collection and is an American made piece of furniture built with certified lumber and recycled steel. Precedent has been building fine furniture for over thirty years and has mastered the combination of comfort and quality style. The Collin Chair frame is guaranteed for life to the original owner.The frame is made of kiln-dried hardwood that provides added resistance to bending and warping. Get to know Precedent furniture in this up close video shot in the DutchCrafters Store. If you need help choosing options for the Collin Chair, please email or call us at 866-272-6773. We are happy to send fabric samples by mail for you to work with at home.